After a forced move from the Amherst Common to Northampton in 2016, this could be the last year that political rally/festival Extravaganja will be held at the Three County Fairgrounds. 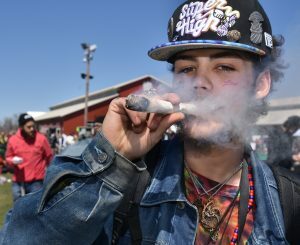 The reason: the student-led University of Massachusetts Amherst Cannabis Reform Coalition (CRC), which organizes the event, is upset by restrictions imposed by the city of Northampton, including barring attendants under the age of 21 — with Five College students above the age of 18 being the exception. John Stewart, on tenor sax, and the Montague-based band Community Smokes play songs during the 26th annual Extravaganja at the Three County Fairgrounds in Northampton in 2017. CRC President Claire Walsh, a junior at UMass Amherst, said she and other organizers with the CRC believe that the age restriction arbitrarily restricts First Amendment rights to freely assemble. She said there is no history of violence in its nearly three-decade history, during which Extravaganja has brought together musicians, performers, vendors, and activists to celebrate cannabis culture and rally behind an end to the national prohibition of marijuana. The only arrest that took place during the past three years was for counterfeit money, according to Walsh. 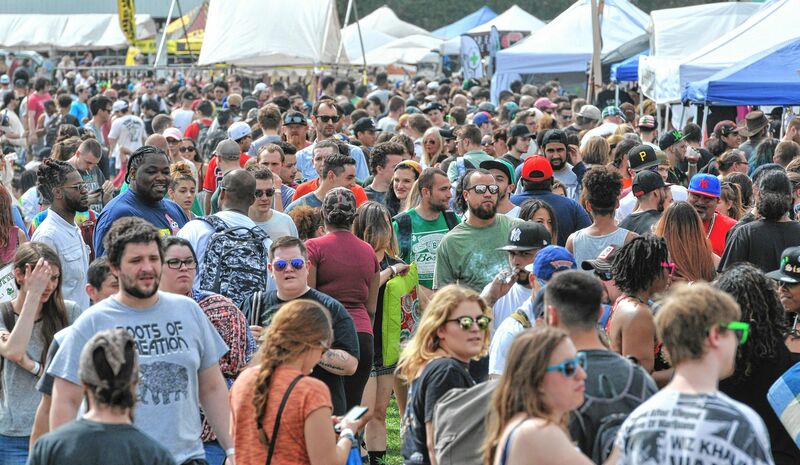 No cannabis is allowed to be sold at the event and anyone who uses marijuana in the public event does so as an act of civil disobedience not affiliated with the CRC. Walsh said that it’s “very likely” the CRC would choose a new location for the event next year. Three County Fairgrounds General Manager James Przypek declined to comment about the list of new restrictions or the future of Extravaganja at the fairgrounds prior to after this year’s event. Northampton Mayor David Narkewicz, who is a graduate of UMass Amherst, said he would welcome the move. He said he thinks the event belongs on the UMass campus. Walsh said the CRC has been advised by the university and their college advisor not to have the event at UMass Amherst because the university would be forced to shut the event down if anyone was caught smoking marijuana, which remains against federal law. UMass Amherst Spokesman Edward Blaguszewski said the university will work with students as they decide how to best conduct the event in the future. Narkewicz said the city has backed Extravaganja’s political cause. “I think it’s fairly well documented that [the city of Northampton] has been supportive of legalization,” Narkewicz said. Age restriction has been an ongoing issue for the CRC, she explained. During the first year of the event at the fairgrounds in 2017, the event was all ages. The second year included an 18+ age limit. Walsh said Extravaganja requires permitting from the city of Northampton and in order to be approved, CRC members must attend meetings with members of the city’s Board of Health, police department, and fire department. The first meeting for this year’s event took place in December 2018. 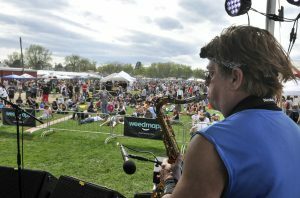 Narkewicz got involved for the first time this year because the city’s health department told organizers that the 21+ requirement was necessary to comply with new state laws surrounding cannabis, Walsh explained. Walsh said initially the city of Northampton had required the event only be 21+ then amended that agreement to allow UMass Amherst students 18+ before ultimately allowing all five college students with a student ID. 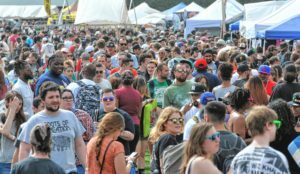 The crowd browses a ring of vendor and exhibitor booths along the perimeter of the 26th annual Extravaganja at the Three County Fairgrounds in Northampton on Saturday in 2017. On March 19, the CRC responded to Seewald by stating, “That is a great reassurance to hear, thank you very much!” in response to Seewald mentioning that the city had confirmed the compromise with Police Chief Jody Kasper and Health Director Merridith O’Leary and that no further documentation was needed. Walsh stated the reason why the CRC accepted the negotiations was because the group was running out of time to finalize a contract with the fairgrounds in order for the event to take place. The CRC is also upset by new restrictions reducing attendance and restricting ticket sales to online only, according to Walsh. Last year, it was estimated that 15,000 people attended the rally. This year, there is a cap of 12,000 attendees, which was placed on the event by the fairgrounds and the city due to traffic control. As for the online only requirement, Walsh said it cuts off access to the event for certain people. Narkewicz confirmed that the cap on attendees was established by the fairgrounds working in conjunction with the Northampton Police Department. He said the city has to work with fairground neighbors and neighboring communities with large-scale events. Walsh said she thinks the city of Northampton is interfering with the event more this year than in the past. “I think the town is focusing on it more this year because they see a chance to cut off people under 21 from having anything to do with cannabis and that’s just not right in my opinion,” she added.